It took three months for Anthony and I to write and research “5 Reasons Why a Wampyr Didn’t Walk in Highgate Cemetery” (Feb. 27, 2015) so it wasn’t a surprise when the sequel “5 More Reasons Why a Wampyr Didn’t Walk in Highgate Cemetery” (May 27, 2015) took another three months to complete. “5 More Reasons” focused on holes in Manchester’s vampire theory, whereas the prequel discussed the geographic impossibilities of the vampire’s location in the cemetery. We sourced online and print resources, compared narratives and I reached out to numerous people via email for clarification on details regarding events and claims. The first person I tracked down was Sandra Harris. Now named Sandra Harris Ramini, she was the reporter who interviewed Sean Manchester and David Farrant at Highgate Cemetery on March 13, 1970 for Thames TV’s Today program. Harris interviewed Manchester at the cemetery’s North Gate where Manchester claims “all hell broke loose”. When I read the passage about the “fainting camera man” in Manchester’s books The Highgate Vampire: The Infernal World of the Undead Unearthed at London’s Famous Highgate Cemetery and Environs (1985; 1991), I suspected he embellished and played-up the event in order to create a more mysterious ambiance for his readers. To double-check my suspicions, I tracked down Sandra Harris online. I first looked for her on LinkedIn and found nothing so I tried Google. When I used the key words “Sandra Harris Thames TV,” a LinkedIn profile showed up on the search results with “Sandra Ramini”—and it was accompanied by a photo of her. I needed to find a photo from back in the day for a comparison to confirm her identity. After about twenty minutes I tracked one down on a blog post discussing the history of West Australian TV. To double-check my sources, I found a current photo from a 2012 article that described Sandra’s career history dating back to when she worked at ABC in Perth—it was definitely her. Left: Sandra Harris poses next to TV camera, ca. 1960s. Credit: WA TV History. Right: Sandra Harris in 2012. Credit: Brooke Bannister – ABC Local; 720 ABC Perth. Photo montage by Anthony Hogg. I tried another avenue and emailed Thames Television on Mar. 15, 2015 and again on May 26, 2015. I was met with a dead end. As of writing this I still haven’t received a reply. My next avenue of investigation was to pursue more information regarding an “animal deaths” article Manchester cited in his book: Graham Newsom’s Finchley Press article, “Animal Deaths—‘Vampire’ Theory” (April 13, 1979), from which Manchester had quoted then-chairman of the Finchley Royal Society for the Prevention of Cruelty to Animals (RSPCA), Joan Ferris, regarding dead animals drained of blood. Sorry for the delay in response – the person I wanted to speak with has been away for Christmas. Sadly, Mrs Ferris has passed away and we do not have contact with any surviving next of kin. I was able to speak to our current Chairman, who joined as a member in the late 1970s. 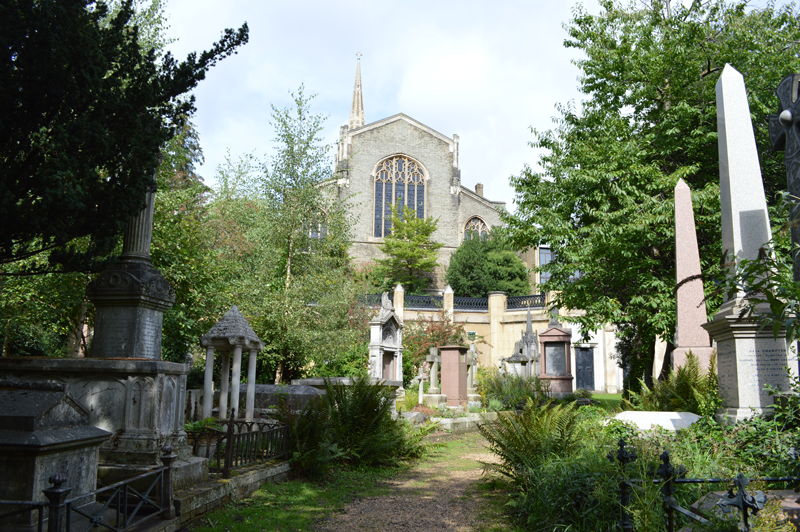 She did not recall the article, although the Highgate Cemetery is still well known in the area. She has said she will look through any old files in case there is anything of interest. In addition, we are meeting next week with the committee, and I will see if we have any minute books dating back to that time and let you know if I find anything relevant. Re animal autopsies, you may not be aware, but this area is very close to the Royal Veterinary College, London – may or may not be useful or relevant, but thought it could give you another area to approach? If I find any more, I will let you know -and good luck in your research. The RSPCA was a dead end so I contacted the Royal Veterinary College, University of London via Facebook in an attempt to retrieve any autopsy reports on the animal deaths. As of writing this I haven’t received a reply. I also contacted the Finchley and Camden Police Departments via their website to obtain police reports on the incidents and received no reply. I couldn’t find an original copy of the article Manchester cited, but knew the British Library would have it. Living in Vancouver, Canada, and knowing how expensive online copies are, I required assistance from someone closer to London. In January, I asked a friend in England, Andy Boylan, who I knew traveled frequently for work if he was planning on heading to London soon. As luck happened, he was in February. We were able to co-ordinate a visit to the library so Anthony ordered the materials online for pick up. Andy emailed me a copy of the article in question and I was a happy girl. I quickly discovered Manchester had selectively quoted the article and left out some important bits from his book—like what was the most likely cause of the animal deaths were (an Alsatian). Also he conveniently omitted certain parts of the actual article he quotes as a report on pages 116 and 117 of his 1985 account. 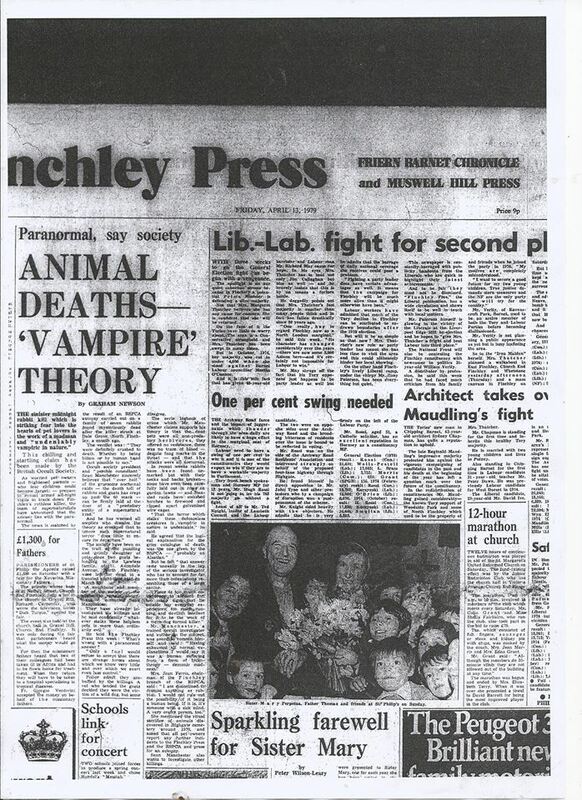 Front page story: Graham Newson’s “Animal Deaths–‘Vampire’ Theory,” Finchley Press (April 13, 1979). Sean Manchester selectively quoted from this article and downplayed rational explanations for the so-called “vampire deaths” featured in book. Credit: Andy Boylan, British Library/Finchley Press. Tracking Manchester’s sources on the animal deaths took more legwork than investigating Manchester’s mysterious “nobleman” claim. His theory was a foreign nobleman ventured to London in a coffin and eventually took residence as a vampire in Ashurst House, which is where Highgate Cemetery now stands. To establish the authenticity of Manchester’s vampire, I needed to locate the nobleman that lived at Ashurst House. The tenant list seemed like the most logical avenue to pursue because if there was no foreign nobleman on the list, Manchester had some explaining to do. British History Online provided detailed citations of dates and names for the area in question. I had hit the jackpot. The site provided a detailed succession of tenants with no mention of a “foreign nobleman” and vol. 17 of Survey of London (1936) describes the timeline and residents even further. “all hell broke loose”: Sean Manchester, The Highgate Vampire: The Infernal World of the Undead Unearthed at London’s Famous Highgate Cemetery and Environs (London: British Occult Society, 1985), 49.
the passage about the “fainting camera man” in Manchester’s books: Manchester, The Highgate Vampire (1985), 49; Sean Manchester, The Highgate Vampire: The Infernal World of the Undead Unearthed at London’s Highgate Cemetery and Environs, Rev. ed. (London: Gothic Press, 1991), 76.
a blog post discussing the history of West Australian TV: Ken McKay, “ABC Presenters Reminisce About the 1960s, 70’s and 80s,” WA TV History (blog), Dec. 8, 2010, accessed June 15, 2015, http://watvhistory.com/2010/12/abc-presenters-reminisce-about-the-1960s-70s-and-80s/. a current photo from a 2012 article: Brooke Bannister, “Who Are You? Sandra Harris,” 720 ABC Perth, May 9, 2012, accessed June 15, 2015, http://www.abc.net.au/local/audio/2012/05/09/3499147.htm. Manchester had quoted . . . Joan Ferris, regarding dead animals drained of blood: Manchester, The Highgate Vampire (1985), 41. Manchester’s mysterious “nobleman” claim: Ibid., 89.
a detailed succession of tenants: A. P. Baggs, Diane K. Bolton, M. A. Hicks, and R. B. Pugh, “Hornsey, Including Highgate: Highgate,” in Friern Barnet, Finchley, Hornsey with Highgate, edited by T. F. T. Baker and C.R. Erlington, vol. 6 of A History of the County of Middlesex (London: Victoria County History, 1980), 122–35, accessed April 30, 2015, http://www.british-history.ac.uk/vch/middx/vol6/pp122-135. describes the timeline and residents: “Ashurst House and St Michael’s Church Monuments,” in The Parish of St Pancras, Pt. 1: The Village of Highgate, edited by Percy Lovell and William McB. Marcham, vol. 17 of Survey of London (London: London City Council, 1936), 54–62, accessed April 21, 2015, http://www.british-history.ac.uk/survey-london/vol17/pt1/pp54-62. Find out how Erin first discovered Sean Manchester’s Highgate Vampire claims were impossible in “Cemetery Logistics: How I Tracked the Highgate Vampire” (April 4, 2015). Previous article Vampire Hypothesis: Is Vampirism Explained Through Homeostasis? Your Sean Manchester article series displays excellent research work.